Before Super Bowl XLIX even kicked off on NBC on Sunday night, viewers were treated to a heavy dose of advertising WTF — not once, not twice, but three times. Yup, I'm talking about that crazypants Mountain Dew Kickstart commercial. I was just sitting there, enjoying some chicken wings and jalapeno poppers, and then suddenly the TV broke out into frenetic electronic beats and dancing animals. The 90-second spot called "Come Alive" is promoting two new flavors of Mountain Dew's Kickstart drinks: Pineapple Orange Mango and Strawberry Kiwi. And I hope you're not tired of it yet, because Mountain Dew is set to air the insane dance party ad during the pre-game, post-game and the Super Bowl itself, according to AdAge. OK, let me give the strange commercial some credit: It did get me to put down my snacks and pay attention to the TV. 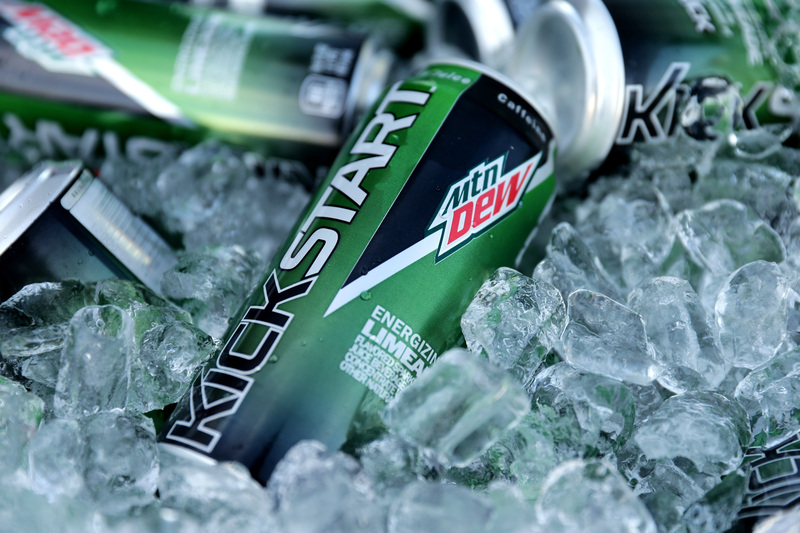 Admit it, your eyes were glued to the screen, too, once a simple and quiet basement video game night for three regular dudes erupts into the weirdest dance party — of course, thanks to one sip of Mountain Dew Kickstart. The three men start wiggling and jiggling as "Out The Speakers feat. Rich Kidz" by A-Trak, Milo & Otis plays, and then the deer head on the wall winks at a dog and says "Hi." Before you can say "WTF," the dog starts dancing, along with art on the walls, fish in a fish tank, and a weird dog statue. I wish I could say it ended there, but there's more wackiness. A recliner gets in on the fun and starts grooving — yeah, an actual reclining couch starts dancing with the guys. By the time the dog starts twerking and the deer head's body busts through the wall, you're wondering if all Super Bowl XLIX commercials are going to be this nuts. The whole thing is like if DJ Snake and Lil John's "Turn Down For What" and Miley Cyrus' "We Can't Stop" music videos had a crazy Super Bowl ad. Check it out for yourself below, along with some extended clips if you're into twerking dogs and the deer saying "Hi!"